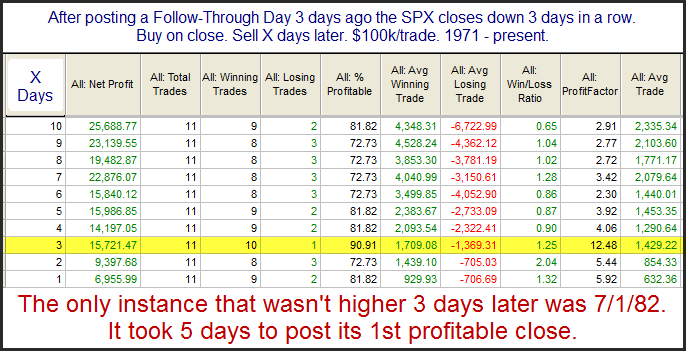 After posting a Follow-Through Day (FTD) on Tuesday, the market has now pulled back for 3 days in a row. Using the database of Follow-Through days from the original FTD study, I took a close look at short-term performance after other such post-FTD pullbacks. Of the 74 previous FTDs identified using the standard parameters from the original FTD study, 11 were immediately followed by three down days. Results following those instances can be found below. We see here some extremely positive stats and what appears to be a strong inclination for an immediate move higher. I'll also note though, that only 3 of these 11 instances resulted in successful intermediate-term rallies from the FTD of 3 days prior.